The XBMC developers added AirPlay support in version 11, and this is one of the features that really drew me to the software. One of the very reasons I contemplated getting the Apple TV was because of the streamlined AirPlay support, but with the addition of AirPlay support to XBMC 11 I thought that it would also fit my needs. I’ll be upfront and say that the AirPlay support in XBMC is not as extravagant as what’s in the Apple TV, but it supports basic operations like sending YouTube videos or videos recorded on your device to the TV. It does not support iOS mirroring, but I’m not as concerned with doing that as I am being able to quickly watch a video on the TV that a friend just sent me. That’s not to say XBMC won’t eventually support AirPlay mirroring since some third-parties have already figured it out, but as of right now you’ll need to be satisfied with watching videos and flipping through photos when using AirPlay on XBMC. I should also note that the Windows version of XBMC doesn’t support AirPlay audio/music playback, but the Mac and Linux variants do. 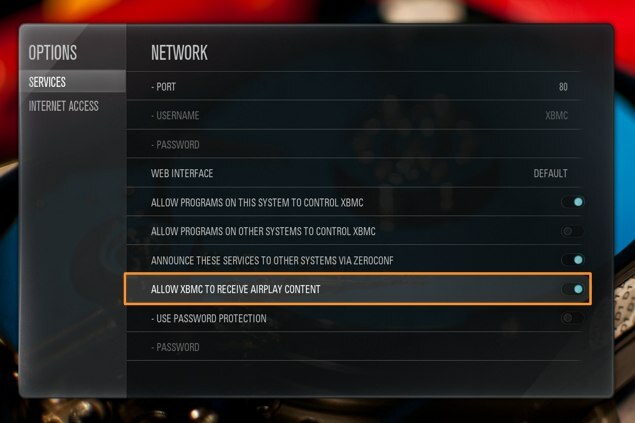 In XBMC go to Settings -> Network -> Services and turn the Allow XBMC to Receive AirPlay Content setting on. When you flip this on the Announce These Services to Other Systems via Zeroconf should also get turned on automatically. While on that same screen (Settings -> Network -> Services) scroll up to the top and enter in the Device Name you want to appear in the AirPlay menu on your iOS device. Test out the connection on your iOS device by opening, for example, a YouTube video and selecting the XBMC install in the AirPlay Menu. Now you should be able to stream content from your iOS device to XBMC in just a few taps.